The 2018 Boston Marathon had historic victories for both the men and the women. 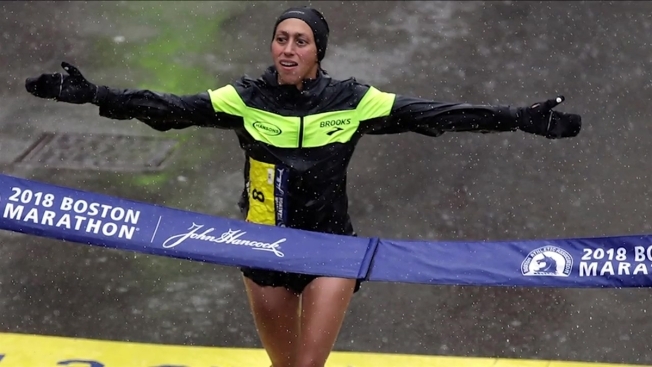 Desiree Linden was the first American woman to win the Boston Marathon in more than three decades in an unofficial finish time of two hours, 39 minutes and 54 seconds. She woke up Tuesday morning hoping her win in the wind and rain on Monday wasn't a dream. Yuki Kawauchi was the first Japanese man to win the Boston Marathon since 1987 with an unofficial finish time of two hours, 15 minutes and 58 seconds. Although this was his 81st marathon, he says he has never run in worse conditions. There were 26.2 miles and wild weather between runners and the Boston Marathon finish line. Hours after the race was won, many runners kept going for the love of the marathon and the people they love, finishing late Monday night. "I am very happy but... it feels like a dream," Kawauchi said. Race organizers say they treated about 2,500 people at the medical tents along the Boston Marathon route Monday, many for cold-related injuries. Temperatures at race time were in the mid-30s, with gusts of up to 32 mph on the 26.2-mile course. Drenching rains only made matters worse. American Sarah Sellers placed second in the women's race. She was unsponsored and trained alone at her home in Arizona.